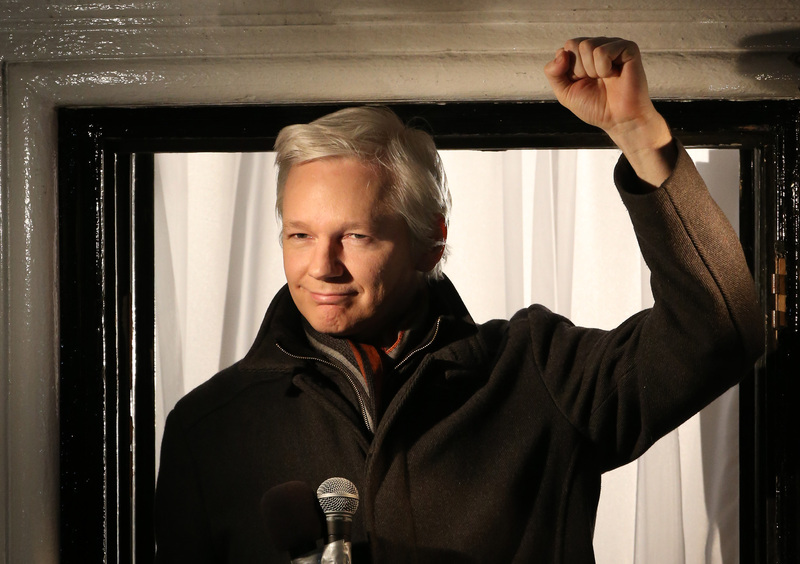 What Will Julian Assange's WikiLeaks Political Party Be Like? Maybe Julian Assange is nervous that Edward Snowden's stolen the whistle-blowing spotlight. The WikiLeaks founder, still chilling (read: nervously hiding) in the Ecuadorian embassy in London, launched his very own political party Thursday. The imaginatively named 'WikiLeaks Party' will exist in his home country of Australia. Assange used the launch as an opportunity to name the WikiLeaks Party's first candidate for the Australian Senate. That nominee is, drumroll please...Julian Assange. Assange has been laying low for more than a year now, so we'll give you a refresher: Assange, a lifelong hacker, formed WikiLeaks in 2006. The group gained international notoriety when it began publishing top-secret U.S. diplomatic and military files in 2010, and has been continuing to do so ever since. Recently, leaks have included classified files regarding Syria, Guantanamo Bay, and the U.S. Department of Defense. Presumably quite bored and hoping for a change of scenery, Assange has decided to form the WikiLeaks Party. He's admitted that the move could help his situation — the UK and the U.S. wouldn't want to risk the diplomatic consequences of marching into Australia to take one of their senators. It's not exactly a political party. Let's start by pointing out that, according to Assange, the WikiLeaks Party isn't really a party at all. "WikiLeaks Party is a party of accountability, it’s not a party of government,” he told the Australian press. “It’s a party to put into the Senate, to make sure whoever is put into the government does their job. It’s an insurance against the election." In other words, it's a watchdog. And it's a small one at that: only six nominees, plus Assange, have been formally introduced. (The party has 1,300 fee-paying members, according to documents.) The Nov. 30 elections in Australia are still a while off, and so far Assange has been pretty opaque about what the WikiLeaks Party actually, well, is. “My plans are to essentially parachute in a crack troop of investigative journalists into the Senate and to do what we have done with WikiLeaks. In holding banks and government and intelligence agencies to account," Assange said. The WikiLeaks Party is joining the Australian Senate for a reason. Assange couldn't run for an American or British political position: he's Australian, for a start, and Joe Biden has referred to him as a "high-tech terrorist." Australia has also been supportive of "protest candidates" in the past. All seven members of the WikiLeaks Party will be running for positions: Assange in Victoria, a south-eastern state of Australia, and the other six in New South Wales and Western Australia. That said, Australian authorities have questioned whether Assange is actually eligible, since he's not a registered voter (good work there, Julian). The structure will be based on Wikipedia. Wikipedia hasn't hosted WikiLeaks in three years, and contrary to the "Wiki" name the two share, there's actually no collaboration between the two organizations. That hasn't stopped Assange from taking inspiration from Wikipedia. No, we don't know what that means either. WikiLeaks Party's core values of transparency, accountability and justice are the template against which we will examine any important issues for Australians: tax reform, asylum-seekers, climate change policy and more...We will not accept legislation or government policy that is based on inaccurate, poorly disclosed or inadequate information. The only policy the party has spoken of is a plan to introduce a "national shield law" to protect a reporter's right not to reveal a source. Assange is yet to say much else that actually has meaning in real-world terms, which we guess makes him a pretty fitting political candidate. The WikiLeaks Party actually stands a chance. An Aussie poll found that a fifth of voters would be "likely" to vote for Assange. In Australia, voting is compulsory.